End of the Rashidi Emirate of Jabal Shammar and Kingdom of Hejaz. End of Ottoman presence in the Arabian Peninsula. Establishment of the Kingdom of Saudi Arabia in 1932. Annexation of Asir and Saudi-Yemeni War in 1934. 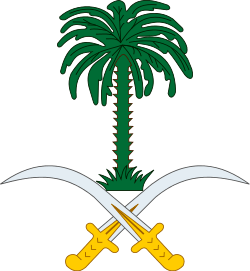 The unification of Saudi Arabia was a military and political campaign, by which the various tribes, sheikhdoms, emirates, and kingdoms of most of the Arabian Peninsula were conquered by the House of Saud, or Al Saud, between 1902 and 1932, when the modern-day Kingdom of Saudi Arabia was proclaimed under the leadership of Ibn Saud, creating what is sometimes referred to as the Third Saudi State, to differentiate it from the Emirate of Diriyah, the First Saudi State and the Emirate of Nejd, the Second Saudi State, also House of Saud states. The Al-Saud had been in exile in British protected emirate of Kuwait since 1893 following their third episode of removal from power and dissolution of their polity, this time by the Al Rashid emirate of Ha'il. In 1902, Ibn Saud recaptured Riyadh, the Al Saud dynasty's former capital. He went on to subdue the rest of Nejd, Al-Hasa, Jebel Shammar, Asir, and Hejaz (location of the Muslim holy cities of Mecca and Medina) between 1913 and 1926. The resultant polity was named the Kingdom of Nejd and Hejaz from 1927 until it was further consolidated with Al-Hasa and Qatif into the Kingdom of Saudi Arabia in 1932. Abdul Aziz bin Abdul Rahman Al Saud. Founder of Saudi Arabia since 1934 and Commander Unification of Saudi Arabia. Sharif Hussain, The Sharif in Mecca and King of Hijaz. 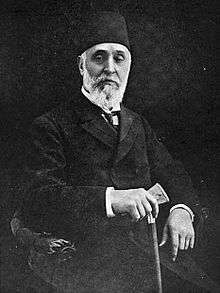 Ahmed Tevfik Pasha, Ottoman Empire Grand Viziers and Commander War in Middle East. Following the Diriyah agreement between Muhammad ibn Abdul Wahhab and Muhammad ibn Saud, the Al Saud clan founded the First Saudi State, a state based on the strict defense of Islam. The ideology born of this period was later dubbed Wahhabism. Originating in the Nejd region of central Arabia, the First Saudi State conquered most of the Arabian Peninsula, culminating in the capture of the Muslim holy city of Mecca in 1802. The loss of Mecca was a significant blow to the prestige of the Ottoman Empire, which had exercised sovereignty over the holy city since 1517, and the Ottomans were finally moved to action against the Al Saud. The task of destroying the Saudis was given to the powerful viceroy of Egypt, Muhammad Ali Pasha, who sent troops to the Hejaz region and recaptured Mecca. His son, Ibrahim Pasha, meanwhile led Ottoman forces into the heart of Nejd, capturing town after town in the Nejd Expedition. On reaching the Saudi capital at Diriyah, Ibrahim placed it under siege for several months until it surrendered in the winter of 1818. He then sent many members of the clans of Al Saud and Ibn Abdul Wahhab to Egypt and the Ottoman capital of Constantinople and ordered the systematic destruction of Diriyah. The last Saudi imam (leader), Abdullah bin Saud, was later executed in Constantinople. The Al Saud survived in exile and went on to found the Second Saudi State, which is generally considered to have lasted from Turki ibn Abdallah's capture of Riyadh (which he designated as the new capital) in 1824 until the Battle of Mulayda in 1891. Compared to the First Saudi State, the second Saudi period was marked by less territorial expansion and less religious zeal. It was also marked by instability, which the Al Rashid clan of Jebel Shammar were able to exploit. The Saudi leader, Abdul Rahman ibn Faisal, sought refuge in Ottoman Iraq in 1893. In 1901, Abdul Rahman bin Faisal's son, the future Ibn Saud, asked the Emir of Kuwait for men and supplies for an attack on Riyadh. Already involved in several wars with the Rashidis, the Emir agreed to the request, giving Ibn Saud horses and arms. Although the exact number of men waxed and waned during the subsequent journey, he is believed to have left with around 40 men. In January 1902, Ibn Saud and his men reached Riyadh. With only a small force, he felt that the only way to take the city was to capture Masmak fort and kill Ibn Ajlan, Chief of Riyadh, and having achieved these goals they successfully took the city within the night. With the capture of his family's ancestral home, Ibn Saud proved he possessed the qualities necessary to be a sheikh or emir: leadership, courage, and luck, and this marked the beginning of the Emirate of Nejd and Hasa, which lasted until 1921. Saudi–Rashidi War, also referred as the "First Saudi–Rashidi War" or the "Battles for Qasim", was engaged between the Saudi loyal forces of the newborn Sultanate of Nejd versus the Emirate of Ha'il (Jabal Shammar), under the Rashidis. The warfare period of sporadic battles ended with Saudi takeover of the Al-Qassim Region, after decisive victory in Qasim on April 13, 1906, though other engagements followed into 1907. In 1913, Ibn Saud, with support from the Ikhwan, conquered al-Hasa from an Ottoman garrison, who had controlled the area from 1871. conquered Al-Hasa and integrated al-Hasa]] and Qatif into the Emirate. The people in these areas were Shias and the Saudis Wahhabi puritans, resulting in harsh penalties for Shi'a Islam in Saudi Arabia, contrary to what the tolerant Sunni Ottomans policy they traditionally had implemented. The Kuwait-Najd War occurred because Ibn Saud wanted to annex Kuwait. Ibn Saud insisted that Kuwait's territory belonged to him. The sharpened conflict between Kuwait and Najd led to the death of hundreds of Kuwaitis. The war resulted in sporadic border clashes throughout 1919–1920. Following Kuwait–Najd War, Ibn Saud imposed a tight trade blockade against Kuwait for 14 years from 1923 until 1937. The goal of the Saudi economic and military attacks on Kuwait was to annex as much of Kuwait's territory as possible. At the Uqair conference in 1922, the boundaries of Kuwait and Najd were set. Kuwait had no representative at the Uqair conference. Ibn Saud persuaded Sir Percy Cox to give him two-thirds of Kuwait's territory. More than half of Kuwait was lost due to Uqair. After the Uqair conference, Kuwait was still subjected to a Saudi economic blockade and intermittent Saudi raiding. In December, the British government (started early 1915) attempted to cultivate favor with Ibn Saud via its secret agent, Captain William Shakespear, and this resulted in the Treaty of Darin. After Shakespear's death at the Battle of Jarrab, the British began supporting Ibn Saud's rival Sharif Hussein bin Ali, leader of the Hejaz. Lord Kitchener also appealed to Hussein bin Ali, Sharif of Mecca for assistance in the conflict and Hussein wanted political recognition in return. An exchange of letters with Henry McMahon assured him that his assistance would be rewarded between Egypt and Persia, with the exception of imperial possessions and interests in Kuwait, Aden, and the Syrian coast. Contrary to its negotiations with Ali, the British entered into the Treaty of Darin, which made the lands of the House of Saud a British protectorate. Ibn Saud pledged to again make war against Ibn Rashid, who was an ally of the Ottomans. Ibn Saud was also given a monthly stipend in exchange for waging war against Ibn Rashid. The First Saudi-Hashemite War or the Al-Khurma dispute took place in 1918–1919 between Abdulaziz Ibn Saud of the Emirate of Nejd and the Hashemites of the Kingdom of Hejaz. The war came within the scope of the historic conflict between the Hashemites of Hejaz and the Saudis of Riyadh (Nejd) over supremacy in Arabia. It resulted in the defeat of the Hashemite forces and capture of al-Khurma by the Saudis and his allied Ikhwan, but British intervention prevented the immediate collapse of the Hashemite kingdom, establishing a sensitive cease-fire, which would last until 1924. Conquest of Ha'il, also referred as the Second Saudi–Rashidi War, was engaged by the Saudi forces with its ally Ikhwan tribesmen upon the Emirate of Ha'il (Jabal Shammar), under the last Rashidi rulers. On November 2, 1921, Jebel Shammar was completely conquered by Saudi forces and subsequently incorporated into the Sultanate of Nejd. Ikhwan raids on Transjordan were a series of plunders by the Ikhwan, irregular Arab tribesmen of Najd, on Transjordan between 1922 and 1924. Though the raids were not orchestrated by Ibn Saud, the ruler of Nejd, nothing was done by him to stop the raiding parties of his ally Ikhwanis. This however changed after the conquest of Hejaz, when the increasingly critical and negative stance of Ibn Saud on Ikhwan raids developed into an open feud and essentially a bloody conflict since 1927. In early 1920s, the repeated Wahhabi incursions of Ikhwan from Najd into southern parts of his territory were the most serious threat to emir Abdullah's position in Transjordan. The emir was powerless to repel those raids by himself, thus the British maintained a military base, with a small air force, at Marka, close to Amman. In 1921, an Ikhwan party raided southern Iraq, pillaging Shia villages, which resulted in 700 Iraqi Shias killed. 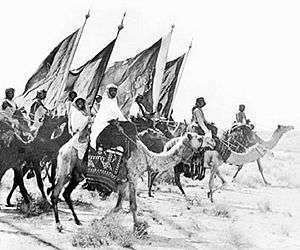 The Saudi conquest of Hejaz was a campaign, engaged by Saudi Sultan Abdulaziz Ibn Saud to take over the Hashemite Kingdom of Hejaz in 1924–1925. The campaign successfully ended in December 1925, with the fall of Jeddah. Subsequently, in 1926, the territory of the conquered kingdom was incorporated into the Kingdom of Nejd and Hejaz, under the Saudi rule. Ikhwan Army in Ikhwan Revolt. Ikhwan strike Alliance British Empire, Kuwait and Ibn Saud. As Saudi expansion slowed in the 1920s, some among the Ikhwan pushed for continued expansion, particularly to the British-controlled territories such as Transjordan to the north - where the Ikhwan raided in 1922 and 1924. The few areas of central Arabia that hadn't been overrun by the Saudi-Ikhwan forces had treaties with Britain, and Abdul Aziz was sober enough to realize the folly of a potential conflict with the British. However, the Ikhwan had been taught that all non-Wahhabis were infidels. Faisal al-Dawish of the Mutair tribe and Sultan bin Bajad of the Otaiba tribe, the leaders of the Ikhwan, were among those who accused Abdul Aziz of going "soft", with the former reportedly telling the latter that the Saudis were "as much use as camel bags without handles". A rebellion erupted, climaxing in a battle at Sabillah, which some have labeled a massacre but pro-Saudi sources consider to have been a fair fight. Additional battles erupted through 1929 in Jabal Shammar and in the vicinity of the Awazim tribe. The rebellion was put down in 1930, with the surrender of last opposition elements. Though the survivors were jailed, their descendants remained opposed to Saudi rule, and one such descendant, Juhayman al-Otaibi, would gain infamy in 1979 when he led the Grand Mosque Seizure. 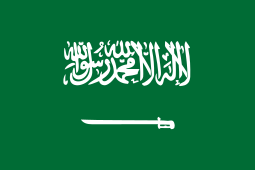 The Kingdom of Saudi Arabia was proclaimed on 23 September 1932. 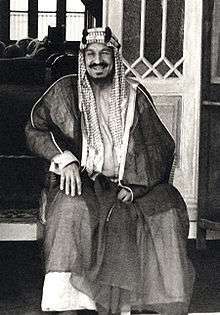 Ibn Saud's eldest son Saud became crown prince in 1933. 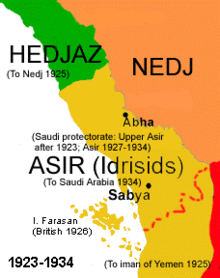 The region of Asir, in what is today southern Saudi Arabia, had been under Turkish rule from 1871 until the outbreak of the First World War, at which point its emir, Hasan ibn Ali Al Aid, "became virtually independent" and attempted to rule from Abha. However, a struggle ensued between his forces and those of Muhammad ibn Ali al-Idrisi, who eventually set up the short-lived Idrisid Emirate under Saudi tutelage. The emirate was subsumed by the Saudi state following a 1930 treaty which provided for the territory to come under Ibn Saud's direct control upon its emir's death. The Emirate was eventually incorporated into the Kingdom of Saudi Arabia in 1934. With the disintegration of the Ottoman Empire, a Zaidi state was forged in Yemen under Imam Muhammad bin Yahya Hamid ad-Din and his descendants. The Yemenis claimed parts of Asir and came to blows with the Saudis in 1933. Writing in the American journal Foreign Affairs in 1934, historian Hans Kohn noted, "Some European observers have wished to explain the armed conflict as a conflict between British and Italian policy in Arabia." Despite British ties to Saudi Arabia and Italian ties to Yemen, he concluded that "the rivalry between the two rulers is in no way caused or fostered by the rivalry of the two European states." However, in 1998, Alexei Vassiliev wrote, "The imam was instigated both by the Italians, who promoted assistance in order to increase their influence in Yemen, and by the British, who wished to detract Imam Yahya's attention from their protectorates in Aden." The Saudis struck back, reaching the Yemeni port of Al Hudaydah before signing a "treaty of Muslim friendship and Arab brotherhood" in Ta'if, which was published simultaneously in Mecca, Sanaa, Damascus, and Cairo to highlight its pan-Arabism. Remarking on the implications of the treaty, which stated "that [the two parties'] nations are one and agree to consider each other's interests their own", Kohn wrote, "The foreign policy of both kingdoms will be brought into line and harmonized so that both countries will act as one country in foreign affairs. Practically, it will mean a protectorate over the Yemen by Ibn Saud, the stronger and much more progressive partner." Relations indeed remained close until civil war erupted in Yemen in the 1960s, at which time the country became a staging ground for battle between conservative values and those of the Egyptian revolutionary Gamal Abdel Nasser. The exact circumstances under which the Ikhwan (brothers, brethren) arose remain unclear. However, it is known that they consisted of Bedouin who were imbued with Wahhabi zeal at settlements known as hijras. They played an important role in the Saudi rise to power, though the extent of that role is sometimes disputed. Annexation of Al-Hasa and Qatif (1913) - unknown. First Nejd-Hijaz War (1918-1919) – 1,392 killed. Kuwait–Nejd Border War (1921) – 200+ killed. 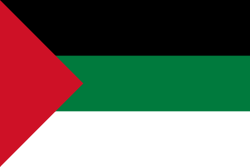 Ikhwan raids on Transjordan (1922–1924) – 500–1,500 killed. Saudi conquest of Hejaz (1924–1925) – 450+ killed. Ikhwan Revolt (1927–1930) – 2,000 killed. ↑ "Ibn" means "son" in Arabic and thus "Ibn Saud" means "Son of Saud" (see Arabic name). Although Westerners widely referred to Abdul Aziz as Ibn Saud in later years, "the clan chieftain's title of Ibn Sa'ud continued to refer to Abdul Rahman" until he had established himself as such." (Lacey 1982, p. 65) Abdul Aziz never referred to himself by this title, and some authors (e.g. Helms 1981, p. 14), avoid using it entirely. ↑ Madawi Al-Rasheed. A History of Saudi Arabia. Cambridge, England, UK: Cambridge University Press, 2002. Pp. 40. ↑ Mikaberidze, Alexander (2011). Conflict and Conquest in the Islamic World: A Historical Encyclopedia. ABC-CLIO. p. 807. ISBN 978-1-59884-336-1. 1 2 Jones, T. Embattled in Arabia. 03 June 2009. ↑ World and its peoples. London: Marshall Cavendish. 2006. p. 29. ISBN 0-7614-7571-0. 1 2 3 4 5 6 7 8 Mary Ann Tétreault (1995). The Kuwait Petroleum Corporation and the Economics of the New World Order. pp. 2–3. 1 2 Michael S. Casey. The History of Kuwait. pp. 54–55. ↑ Mohammad Khalid A. Al-Jassar (2009). Constancy and Change in Contemporary Kuwait City: The Socio-cultural Dimensions of the Kuwait Courtyard and Diwaniyya. p. 80. ↑ The origins of this event with the Ikhwan dissenters are described in multiple sources, though Lacey 2009 contains one of the most up-to-date accounts. For more information on the Grand Mosque Seizure itself, see The Siege of Mecca by Yaroslav Trofimov. Helms, Christine Moss (1981). The Cohesion of Saudi Arabia. Baltimore: The Johns Hopkins University Press. Kohn, Hans (October 1934). "The Unification of Arabia". Foreign Affairs. 13 (1): 91–103. doi:10.2307/20030644. Al-Rasheed, Madawi (2010). A History of Saudi Arabia (2nd ed.). New York: Cambridge University Press. ISBN 0-521-74754-6. Vassiliev, Alexei (1998). The History of Saudi Arabia. London: Saqi. ISBN 0-86356-935-8. Wikimedia Commons has media related to Atlas of Saudi Arabia.